During the month of Ramadan, Muslims have to change their routines a bit in order to observe the month with proper religious sentiment. Besides avoiding eating and drinking during Roza (fasting period), they also try practicing self-constraint in order to purify their souls. 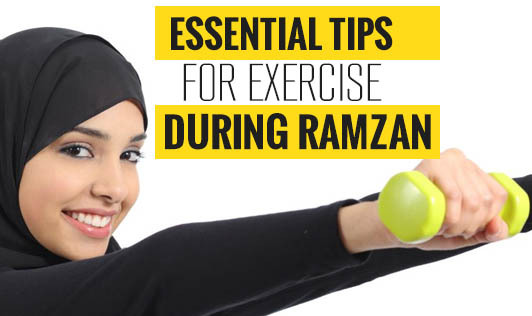 However, most people are confused as to whether they should exercise during Ramadan. There is an easy way to work around this glitch though! The points below give some tips that one can incorporate into their existing fitness and diet plans to achieve preset health and fitness objectives during the period of Ramadan. This month brings a change in the daily routine. Health and fitness gets disturbed due to the fasts and prayers, thereby, permitting very little time for doing workouts. So, in order to continue exercising, one must try adjusting their goals. It is important and always better to focus on maintaining the current physical state rather than pursuing some other intense goal. Tweaking goals can help one stay fit, whilst observing Ramadan without causing any damage to health. If it is possible to squeeze in time for a regular workout during Ramadan, the best option would be to do a low- to moderate-intensity workout. During Ramadan, the body runs on minimal energy reserves, and doing an intense workout can cause damage to health, making the fasting experience difficult. Two is better than one! So why not implement the same for workouts too? The best workout regime recommended during Ramadan is one that is a mixture of weight training as well as cardio. These mixed exercise patterns will help to burn out all the excessive calories consumed during the two meals (Sehri & Iftar) and reduce body fat, whereas, the weight training exercises will help utilize all the protein and carbohydrates in muscle building. Working out with full intensity during Ramadan is a hard thing to do, however, this does not mean that a person should let go of it altogether. One must find time for workouts no matter how small they may be and keep doing it on a regular basis. It will at least help to keep fit, if not help one make progress towards achieving their health and fitness goals. There are days when even during the fasting period, an individual feels energetic. Similarly, there are also days when despite the healthy eating during Sehri, one feels down and low. It is for these reasons that assigning a fixed time for workout is perhaps not a good idea during Ramadan. Instead, working out whenever ready is a better way to go about exercising.